“I hope I can fight for a World title this year,” said Whyte. “Sky Sports and Matchroom are behind me and now it’s my time to shine. If I can put on a good show in front of a good crowd at The O2 then they can’t deny me. “I’m highly ranked in all the governing bodies and I think I could become mandatory in two of them, so this is a fight with a top contender against an undefeated former World champion – so you have to say that win this, I deserve a World title shot. “He’s a solid fighter and he’s got KO power. Any big guy can chin anyone at any time, but he’s just got power. A lot of people are in boxing because they are big men – not because they have skill or heart – they’re just physically big and over-powering smaller fighters. “The guy is a bully and calls himself ‘an enforcer’ so you have to deal with that in a head-on way. Robert Helenius wasn’t like that, he was cool, so I was cool, but Lucas has stepped to me in a demeaning way that I don’t like, I take that personally and I’m not going to let it slide. He’s giving it the big one because he’s got insecurities. This is my city, he’s in my backyard, and I’m not going to let him take liberties with me. “You can’t intimidate me. I’ve been right at the bottom and I’ve risen up, so nothing fazes me and I’m not scared of anything, especially not Lucas Browne. I’m more scared of my Mum than him. “The build-up will be spicy and fun, but I think it’s going to a great fight and all that matters is winning on March 24,” said Browne. “He calls me a ‘bully’ – well I’m going to show him what a ‘bully’ can do. I made my points today, I’m coming to fight, not for a payday or to roll over, I want his belt and I want to be a World champion again. “I asked him if he was going to shake my hand and he did – I’m a gentleman. I still hate the guy and want to smash his face in at The O2, but man to man, this is a sport and we should respect each other for fighting. “I don’t like judges’ decisions – it’s not good for me to have my life and my career in the hands of three people outside the ring. If I KO someone – there’s no argument, that’s what I like. 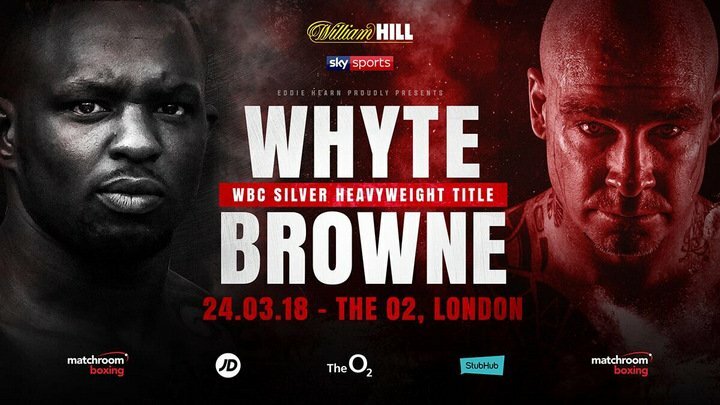 Dillian Whyte will defend his WBC Silver Heavyweight title against Lucas Browne in a crunch clash at The O2 in London on March 24, live on Sky Sports. Whyte is hunting World honours after he landed the title in his last outing in Cardiff in December against Robert Helenius and the 29 year old puts his number one ranking in the WBC on the line against the Browne. ‘The Body Snatcher’ is gunning for WBC king Deontay Wilder with the ultimate goal to land the title and set up a huge unification rematch with old foe Anthony Joshua, and Whyte knows he must put an end to his bitter online feud with Browne in style in Greenwich. “I can’t wait, I hate Lucas Browne and I want to hurt him,” said Whyte. “He’s said some nasty things and he’s going to have to pay for them. “I don’t think he really wanted this fight. A deal was in place before then he started to try and change the terms. He kept delaying things after we gave in to his demands and started saying there was a fight in America he was chasing. We’ve bent over backwards and up till now he’s been more interested in making excuses than taking the fight. It’s been frustrating but we’ve finally got over the hill now so let’s go. “He’s a big guy with an unbeaten record so you have to rate him a bit. He carries some power. You have to respect Heavyweight power, it only takes one punch. Browne is a dangerous customer for Whyte to put his World title dreams on the line against, with the unbeaten Australian already tasting victory on the road at the very highest level when he KO’d Ruslan Chagaev in March 2016, climbing off the canvas in Russia to land the WBA title. ‘Big Daddy’ is no stranger to fighting in England as will be looking to claim a fifth KO win in his sixth outing on English soil, and launch himself into World title contention. “I’m genuinely looking forward to coming over to the UK again and bashing Dillian,” said Browne. “If Helenius and Dereck Chisora hurt him, wait until he feels how I hit. I don’t like anything about him. He’s a loud mouth and I want to take his head off. Browne’s manager Matt Clarke added: “Lucas has an incredible fan base in the UK and Ireland. You’ll never see him turn down an autograph or a photo with fight fans and consequently he gets a lot of support. “This is going to be an electric fight that I’m very happy to finally get over the line,” said Eddie Hearn. “There is no love lost between them and it’s a fight that is very important in the World Heavyweight landscape.